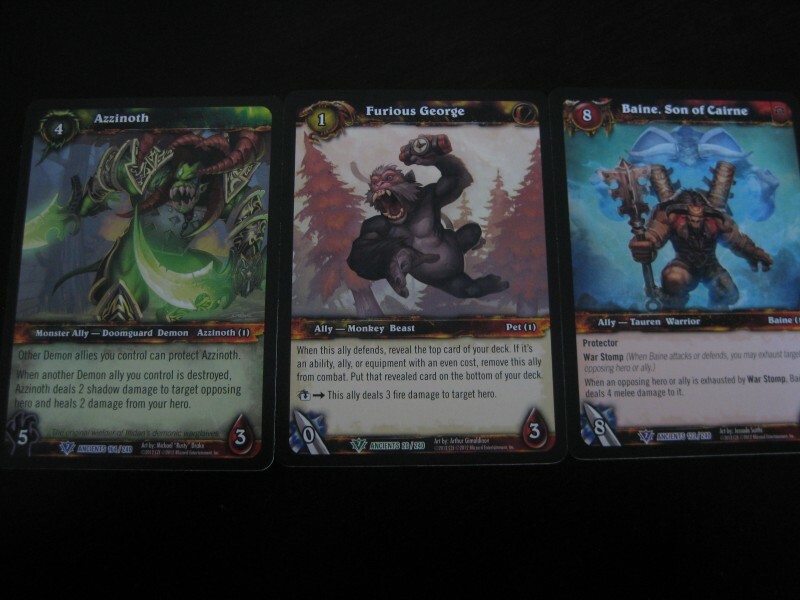 WoW TCG – War of the Ancients is here and have I got “Eyes” for you! 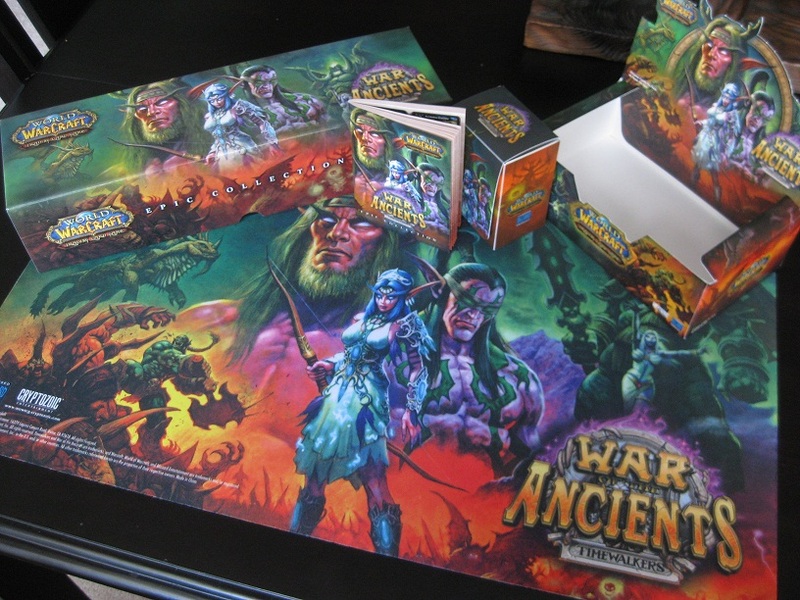 Finally went through my Epic Collection and booster boxes of the new WoW TCG expansion, Timewalkers: War of the Ancients and once again I must say, Cryptozoic did an excellent job putting out another great set! With a huge set of hero cards from heroes and villains past and present, new abilities, allies and gear to choose from, this is turning out to be an awesome block. I can’t wait to see what’s in store for the next two sets. This is an interesting card. 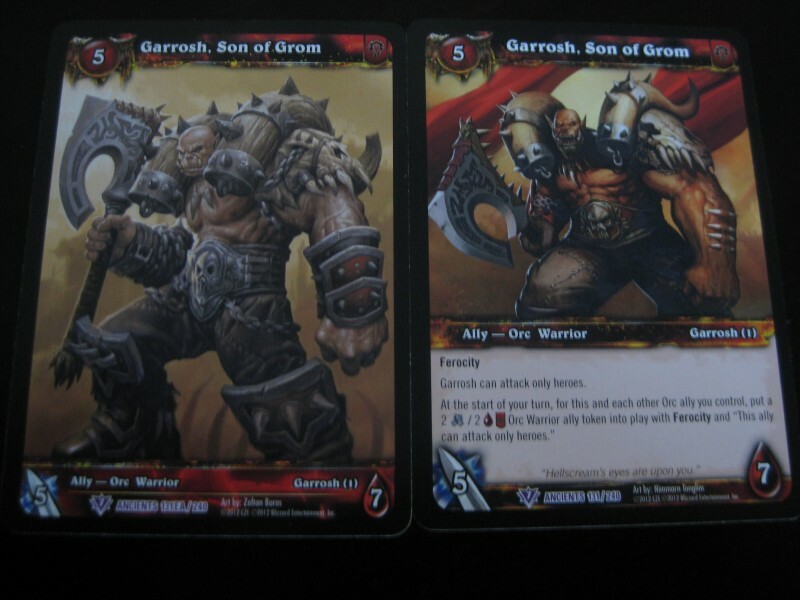 The card on the right is numbered as “EA”, which stands for Extended Art. 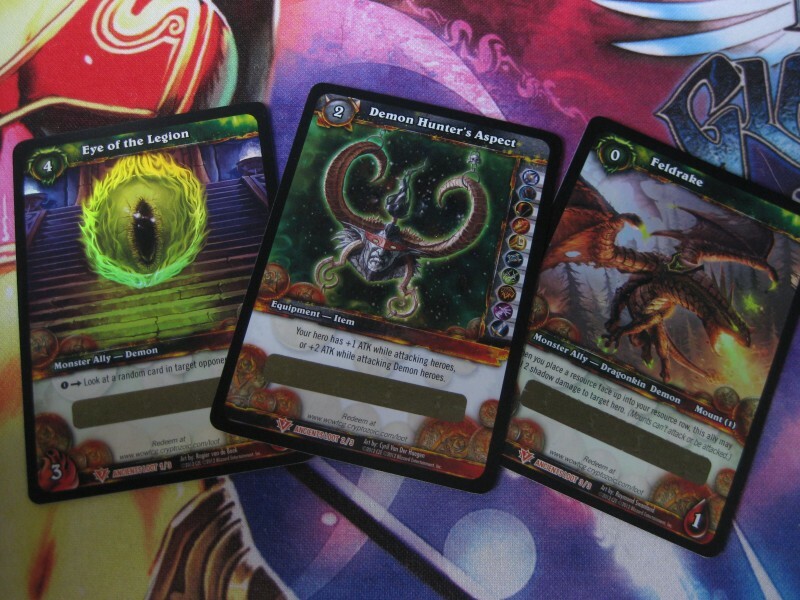 Extended Art cards are usually promo cards that are given out at events like Sneak Peaks, New Releases or Tournaments. 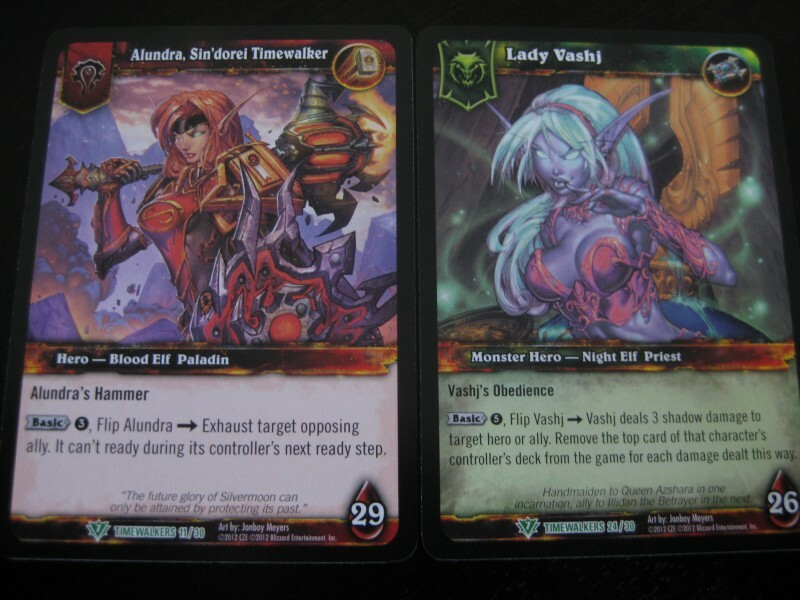 And they are usually “extended” versions of the original art pieces that are surrounded by the card text and borders. This card is neither; it’s a new art piece, which I think looks better than the original. 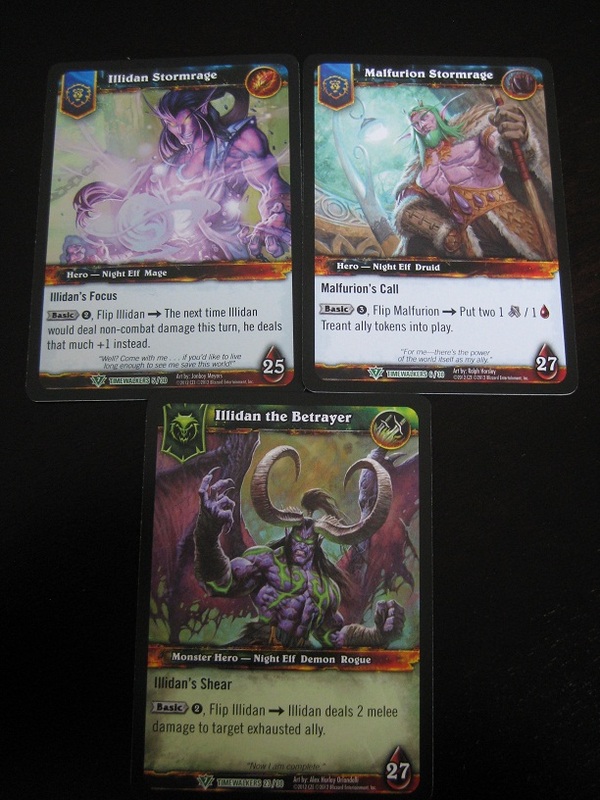 I think it’s cool that Cryptozoic is now inserting these Extended Art cards in the packs. Poor Rhonin. Did he really perish at the Battle of Theramoore, or is he really just “lost in time”? 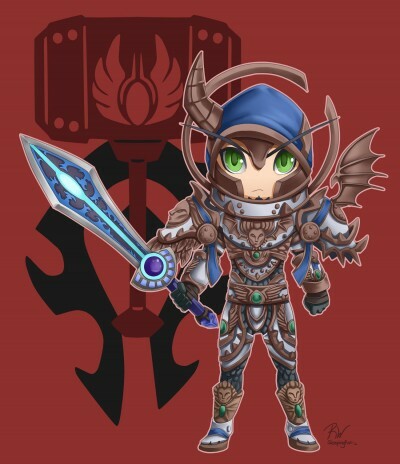 Only Blizz time will tell…. Hey, these guys look familiar, lol. 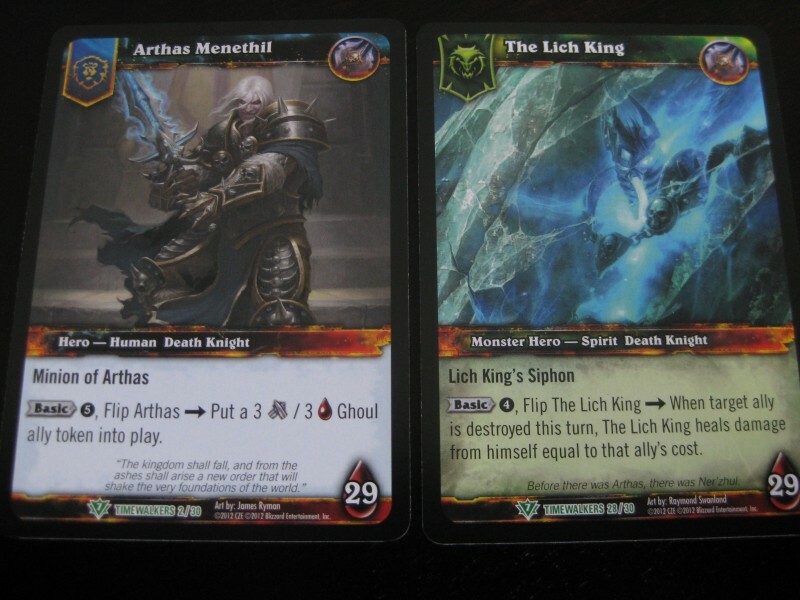 And what everyone’s been waiting for, the phat loot cards! I’ve only redeemed the Eye of the Legion and the Demon Hunter’s Aspect loot cards, not sure what I want to do with the Feldrake, as I’m not really fond of the recolored drake mount. I might try to sell it though, we’ll see. 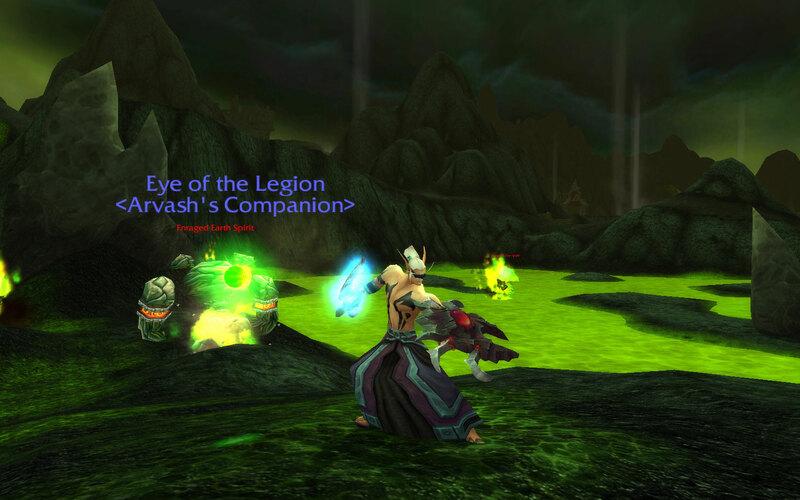 The Eye of Legion is a nice addition for any pet collectors out there. 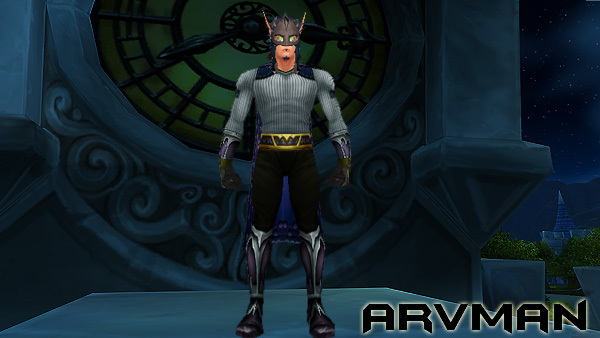 It shares the same model as the upcoming Darkmoon Eye that’s going to be released with the new additions to the Faire. It’s considered an Undead pet for you pet battlers, so if you’re missing this type of creature, here’s a good pick up for you. The Demon Hunter’s Aspect is a fun on-use item that transforms you into a version of Illidan himself, complete with blindfold and tattoos. The disguise lasts for 5 minutes, has a 30 minute cooldown and has unlimited uses. Using this item also changed the color and style of my hair, Arv currently sports short dark hair. I’m not sure how this item works for the other races or females, but it is a cool item regardless. I only wished that it would also give me some temporary War Glaives to play with, lol. 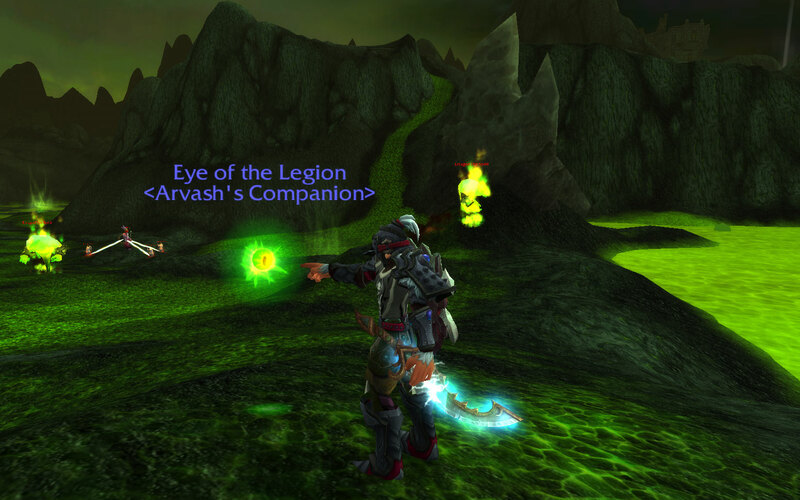 So do you want your own Eye of Legion to follow you around too? Well, you’re in luck, I have two eyes to give away to two lucky readers, all you have to do is leave a comment at the bottom of this post. You can comment as much as you would like, but I’ll only count your name once. Your comment must be in by Saturday, October 26th at 12 am US-EST for you to be included in the drawing. Once I have all the names, I’ll throw them into my opened Puzzle Box of Yogg-Saron (aka hat) and draw out two random peeps. I will update this post with the winners and email them with the codes to redeem from Landro Longshot. Good luck to all! UPDATE: Congrats to Cymre and Khizzara, you guys are the brand new owners of some green eyeballs! 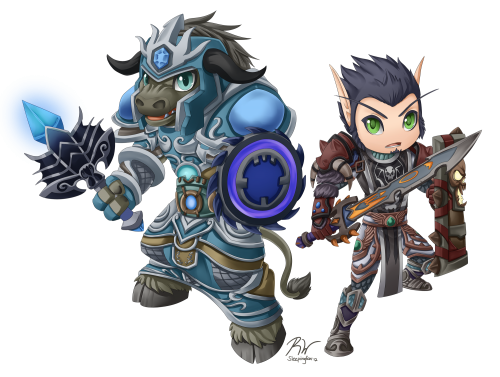 Mogu’shan Vaults – Curse you, Feng! 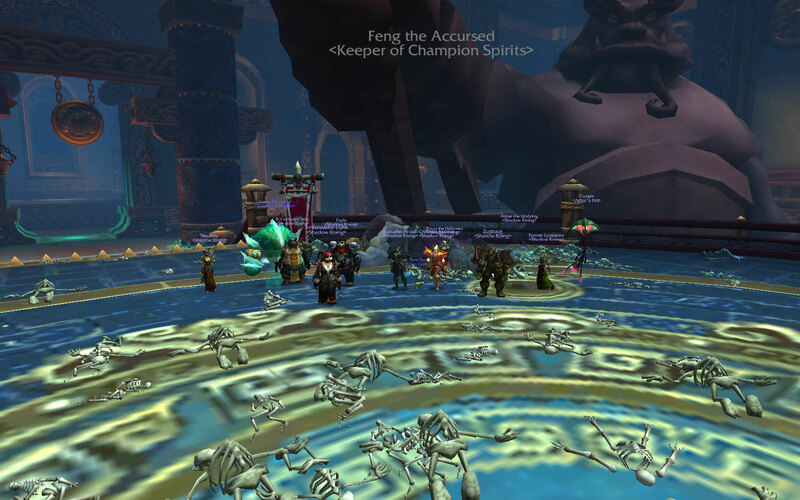 We finally got Feng the Accursed down last night after putting many attempts Tuesday and Wednesday. This was another tanky and heavy movement fight that really tests your reflexes and your position placement. At the beginning of the fight, the tanks need to pick up one of two gems that spawn in the middle of the room. The Shroud of Reversal is an ability that allows you to mimic one of Feng’s abilities that he uses, which you can use against him. This is a channeled cast and has to be targeted on another player for you to copy his spell. You cannot use the Shroud on yourself, so make sure that Feng is attacking the other tank or player. It is on a 30 second CD, so you could make good use of it if you’re quick on the draw. The other gem is the Nullification Barrier. This allows the tank to put up a bubble similar to a Death Knight’s Anti-Magic Shield to prevent incoming damage to the group or even Feng. It is on a 90 second CD, so it has to be used at the right time. In phase 1, Feng uses three abilities, Lightning Lash, Lightning Fists and Epicenter. Lightning Lash is a stacking debuff that he puts on the tank that deals damage every 2 seconds for 20 seconds. This is one of the tank swap mechanics of the fight, you want to try to keep the no higher than two as much as possible. Lightning Fists is a frontal cone attack that interrupts and stuns anyone who is it front of Feng. This is what the Shroud tank should steal and use against him for the third ability he uses, Epicenter. Epicenter is a channeled AoE ability that does lots of damage the closer you are to Feng. The Nullification tank should use their barrier here if the Shroud tank cannot interrupt or if it’s too late for the raid to run out. This part of the fight is what gave me the most trouble. The DBM timers were wonky at times and I would cast Shroud on Moog either too early or too late and mimic Lightning Lash instead of Lighting Fists. So I would use the raid chat announcements instead to know when to cast Shroud. Moog and I would alternate our gem abilities every Epicenter, so we could manage our CDs and make sure that we would always have one of them available. Phase 2 begins when Feng is at 66% health. In phase 2, Feng switches over to his fire abilities, Flaming Spear, Wildfire Spark and Draw Flame. Flaming Spear is another stacking debuff on the tanks, just like Lightning Lash, so you also want to keep the stacks to two at the most. Wildfire Spark is a debuff that Feng puts on any non-tank player that places a patch of fire on the floor after 5 seconds. You want to get this away from the raid as far as possible. Draw Flame is Feng’s third ability that he uses to consume all the fires that come from Wildfire Spark. The more fires Feng consumes, the more AoE damage he does to the raid. For this fight, Moog and I tanked Feng in the middle of the room and we made use of Lyssi’s warlock Teleportation gates to placing the Wildfire Spark fires away from the raid. I tried to use the Shroud on a player with the Wildfire Spark debuff, but everyone away too fast for me to channel it. It’s not really needed for phase 2, but the Nullification barrier is. What it does is it prevents Feng from absorbing the fires during Draw Flame, so Moog placed his barrier in the path between Feng and the fires. Since the CD is long on the barrier, Moog was only able to use it twice during the four Draw Flames in the phase. So he used it on the second and fourth Draw Flames so that we wouldn’t transition into phase 3 with Feng all buffed up. Phase 3 begins when Feng is at 33% health. 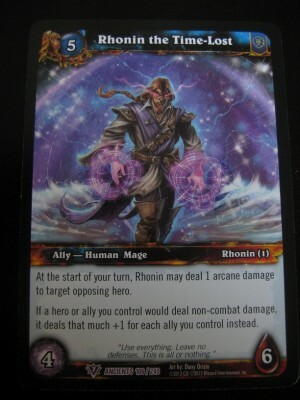 In phase 3, Feng gives up playing with fire and goes arcane with Arcane Shock, Arcane Velocity and Arcane Resonance. Arcane Shock is just like Lightning Lash and Flaming Spear for the tank, so make sure to swap at every two stacks again. Arcane Velocity is the exact opposite of Feng’s Epicenter from phase 1; the farther you are when he channels this ability, the more damage you take. It’s important for the raid to stack during this. Arcane Resonance is a debuff that is placed on a ranged player or healer and does AoE damage to anyone 6 yards around them. This person needs to GTFO from the raid if they get targeted with it. Nullification barrier is again essential to this phase and should be used during Arcane Velocity, when everyone is stacked up together. We used our Bloodlust during this phase as this is the final phase and our two top melee hitters, Zug and Fayle don’t have to move at all, so they could just wail on the boss until he went down. Looking back at the fight, I’ll have to find out better uses for Shroud in phase 2 and 3 as I could probably help out more with the dps in stealing Wildfire Spark and Arcane Resonance. We put in a couple of attempts on the next boss Gara’jal and I’m thankful that Moog and I get to take a break from tank dancing as this seems to be more of a dps and healer fight, lol. All I can say is thanks to everyone at Shadow Rising for being patient with Moog and me. I know it’s been a rough two weeks of raiding with all the wiping involved, but I think we’ve got it down pat. Can’t wait to get a Troll kill under our belts next week! 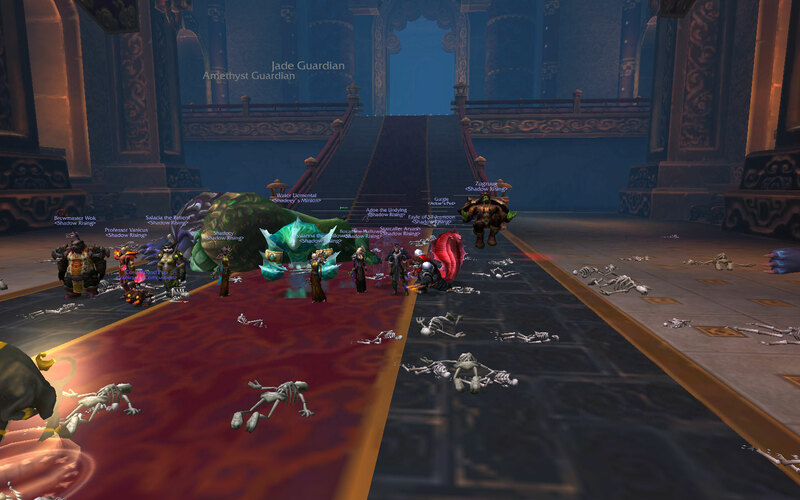 Mogu’shan Vaults – Who Let the Dogs Down? It took us a couple of days and a ton of wipes, but Shadow Rising has finally downed the first raid boss of the MoP expansion, the Stone Guard from Mogu’shan Vaults! I will admit, I didn’t think this boss would be that difficult, but after we got the mechanics down, it was time to put these stone pups to sleep. Keep the two groups of dogs spread at least 20 yards apart, or the width of the carpet in the middle, so that the solo dog does not gain any energy as much as possible. Make sure that the dog that is casting Petrification is always paired up with the lowest energy dog. 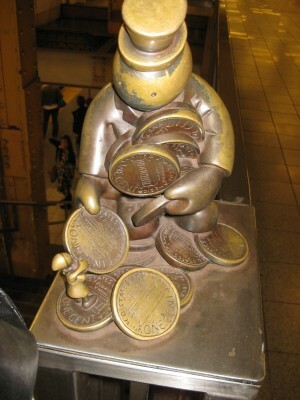 A dog will not cast Petrification twice in a row. So once it Overpowers, be ready for one of the other dogs to cast and plan your swap accordingly. Avoid the bad stuff on the floor, but maintain your distance from the other tank. As you can see, the tanks have a lot to keep track of. Not only do you have to worry about which dogs to swap to and when, but you have to be aware of your distance, move away from the pools/mines/etc., all while using your tank cooldowns to survive and your dps rotation to keep aggro and assist with the other dps to take these dogs down. This week, we had the Cobalt, Jade and Amethyst dogs up. So we didn’t have to worry about Jasper’s chain link ability, but we still had a lot of bad stuff on the floor to avoid from with Cobalt’s frozen mines and Amethyst’s purple pools. Adoe initially was calling out the switches, but then Lyss suggested that the tanks should be the ones to call out swaps. This allowed Adoe to focus on his dps more and call out other alerts, like when to break the mines when Cobalt was casting Petrification or using raid cooldowns. I was still feeling sick like a dog, pun intended, coming back from my trip to NY/NJ last week and really didn’t want to talk on vent. But I sucked it up and called out the swaps, even though it costed me several houndred coughs and 3/4ths of my lungs to come out, lol. Seriously, I was saying this throughout the fight out loud to myself, lol. Hey, whatever works, right? Pre-targeting also helps for quick taunts, especially if you have dogs with high energy already. In the above scenario, once Jade Overpowered, I had him targeted right away in case Amethyst was the next to cast. If Cobalt was next, I could just tab back to Amethyst and continue dpsing him. This is a pretty challenging fight for tanks and it really keeps us on our toes, like Ultraxxion and, yes, Nefarion. =P Just plan you swaps ahead and you should be able to get these dogs down too. Sorry for the blog silence (again), just came back from another vacation to the News, Jersey and York. The last time is was in the NY/NJ area was four years ago for my cousin’s wedding and what do you know, I was back there again for another cousin’s wedding, lol. It was an awesome week, spending good times with my immediate and huge extended family, can’t wait to go back soon! The Saturday that I arrived, I met up with Fayle and Zarm for some Korean BBQ lunch, finally getting to put a real face to these pixellated toons I’ve been playing/raiding with these past couple of years. We talked about WoW for a little bit, but mainly talked about politics, religion and how much Fayle’s net worth is…..lol, j/k. These guys were mad cool and hope to see them again next year, for a possible guild meet up with the rest of the SR crew. 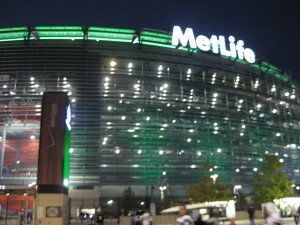 I went to see the Houston Texans play the New York Jets at Met Life Stadium in Jersey for Monday Night Football with the ‘rents and the sibs. Got to see Tebow live in action since his days at the University of Florida. Rex Ryan should have played him more, Mark Sanchez failed to impress his guests (us) and ended up throwing three interceptions in a loss. Oh well, it was still neat to visit the stadium at least, lol. 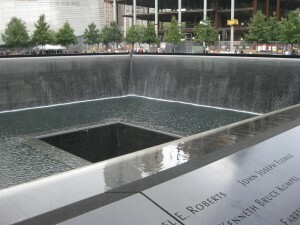 I got to see the 9/11 Memorial, the site of the World Trade Center attacks that happened in 2001. It was an experience I’ll never forget, I got the chills as I walked around the massive pools that were created in memory of those who died that day. 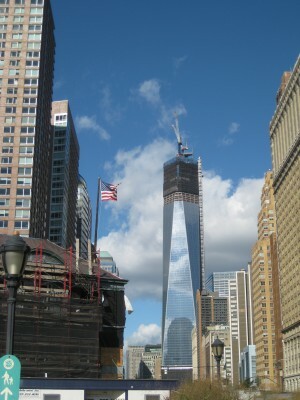 The city is going strong and rebuilding, as you can see from the Freedom Tower (the top image) in construction. 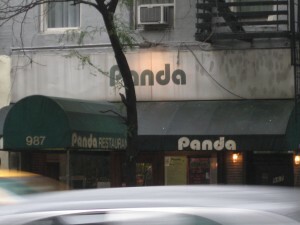 Spent a lot of time walking and taking the E and R subway trains in NYC, visiting other landmarks: walking to Battery Park to see the Statue of Liberty, shopping in Soho, walking the High Line and seeing the various art pieces that have taken over the old train tracks and eating towering sammiches at the Carnegie Deli Restaurant. I even had my 5 seconds of fame on live tv, as I stood outside the NBC Studios right behind Kathy Lee Gifford on the 10 o’clock hour of the Today Show, lol.